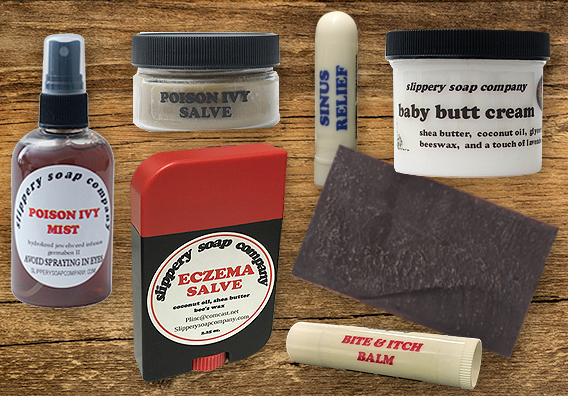 Good old, trusty New Hampshire made remedies "for what ails ya!" Whether you're itchin', scratchin', stingin', burnin' or stuffed up... we've concocted a remedy that would make grandma proud! A finger tip is all that is needed. Starts as a salve, melts, and then spreads. Massage into the affected area. Feel as it becomes icy-hot, and get the relief you want. This fabulous salve stops the dryness and itchiness! The best natural ingredients you can apply to relieve eczema are shea butter and coconut oil. Once applied, those, mixed with bees wax, remain on your skin for hours on end. This constant contact allows it to do it’s job. Large, stick-deodorant-style applicator. Specially formulated soap bar for treating acne and dry skin. One of our classics. For head lice, dandruff, psoriasis, fleas on pets and more. Our old time remedies are wholesome formulations and recipes made with the finest ingredients available. No guarantees, medical claims or warranties are being expressed or implied with these products. They have not been clinically tested and the user’s results may vary depending on an unlimited number of possible variables.